In the wake of the recent flooding in Colorado, All Phase Restoration is offering free disaster preparedness consultations to Colorado businesses to help them prepare for future floods and disasters. After the recent devastating Colorado floods, All Phase Restoration stepped up to the plate as the area’s premier flood restoration specialist. In the wake of the flooding, All Phase is offering free disaster preparedness consultations to Colorado businesses in the hope of relieving the severity of future disasters. Additionally, All Phase offers flood restoration services including water and sewage extraction, disinfection, dry-out of structures and contents, and if need be – demolition. All of this, combined with their certified roofing contractors, certified mold remediation specialists and educational resources, makes them a thriving resource in Colorado for minimizing loss in the midst of future disasters. During the consultation, All Phase Restoration professionals will evaluate your property, identify potential problems, and offer solutions to those problems. They also provide business owners with a go-to manual should a disaster occur. This includes information such as where emergency shut off valves are, and is all provided free of charge with absolutely no obligation, however All Phase is confident business owners who receive this consultation will call them first in the event of a disaster. All Phase Restoration has been serving the Colorado area since 2003 and has seen a range of natural disasters from blizzards to floods, and even tornadoes. Colorado weather is known to be unpredictable and unforgiving. For this reason, All Phase Restoration now offers a free property assessment to businesses for disaster preparedness as well as ongoing classes concerning disaster and restoration related issues for insurance agents and adjusters in Colorado and Wyoming. They do this as a service to business owners and as a way to establish relationships in the community they themselves live in and care about. All Phase Restoration realizes that disasters such as floods don’t always occur at the most convenient times. For that reason, in addition to their disaster preparedness consultation, they provide 24/7 emergency restoration services. When it comes to floods, quick response is of the essence to minimize losses. All Phase Restoration professionals maintain a sense of urgency – not only at times of emergency, but throughout their entire flood restoration projects. Water is the enemy to structures and the contents therein and All Phase Restoration does not rest until the job is done. 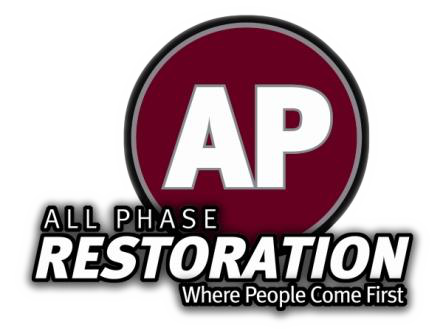 All Phase Restoration serves the greater Colorado area, and has offices in Windsor, Englewood, and Frederick. Flood and water damage to a business is no laughing matter, but that’s no reason for the preparedness education program to be dull. With that in mind, All Phase Restoration tries to make all of their consultations, education and outreach programs both informative and entertaining. Reach out to All Phase Restoration for all your disaster preparedness and emergency restoration needs in the greater Colorado area.